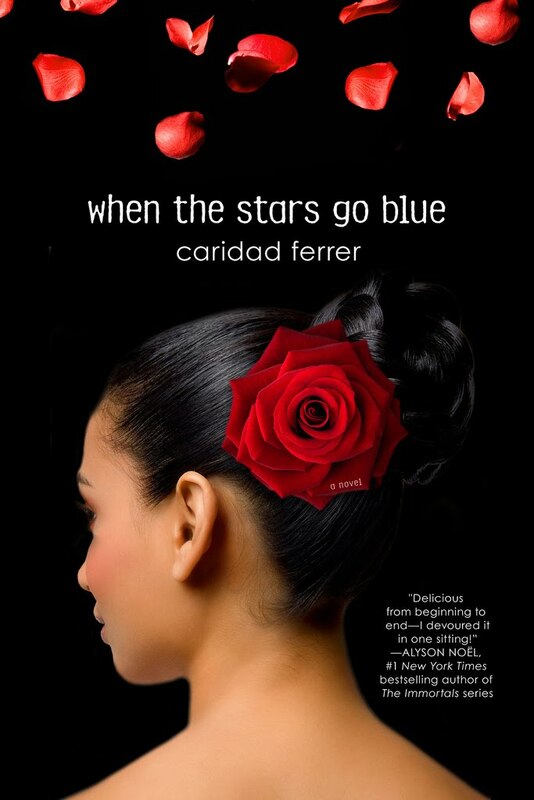 When the Stars Go Blue by Caridad Ferrer. (Grades 9 and up.) St. Martin's Griffin, November 2010. 336 pages. Reviewed from ARC provided by publisher. All Soledad has ever wanted to do was be a dancer and now that she's graduating from a top performing arts school in Miami, she plans to head to New York for auditions... until Jonathan steps into her life and gives her an offer that will change everything. Jonathan is a lead trumpet player in a competitive horn and drum corps and they're performing music from Carmen this summer. They need a talented dancer to play the role of Carmen and he's basically offering the part to Soledad. It's something she'd never considered doing, but once she sees the corps perform, she's hooked. As she performs with the corps, and falls head over heels for Jonathan, Soledad has some choices to make about her future. Choices that are complicated by the arrival of Taz, a sensual soccer star from Spain whom Soledad just can't get out of her head. The rich descriptions of Soledad's dancing are what first drew me in to the book. Her blazing romance with Jonathan got me hooked. And then curiosity about how this retelling of Carmen would play out kept me going through the rest. Okay, so when I started this book, I really had no idea what happened in Carmen. So, I looked it up. I'd highly recommend you read a summary of the opera before you read this book (if you're not already familiar with it). The story is fine without knowing about Carmen, but it adds a whole new level and I think it's really well done. I love Ms. Ferrer's use of Spanish language in the book. It feels true to the characters and adds to the feel of the book. They're not constantly repeating themselves in English, but non-Spanish speakers can still easily figure out the meanings of the Spanish phrases. This is how it's done! The lush writing helps bring Soledad's dancing and the performances of the corps to life. I'd love to see this book as a movie because I think that the music and dancing would be fabulous! Though there were a couple of parts that dragged a bit for me, overall this was a fantastic read. I'd definitely recommend it to fans of Perfect Chemistry by Simone Elkeles or anyone who loves watching dance movies (Center Stage, anyone?) as much as I do. Actually, let's look at a little bit of Center Stage right now, shall we? When the Stars Go Blue will be on shelves November 23.